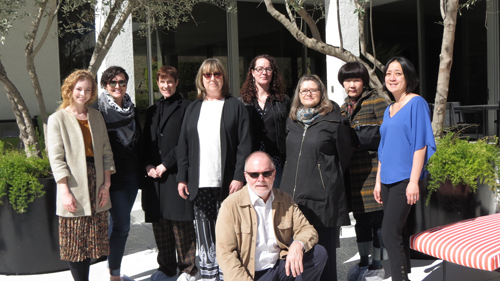 Lancaster, PA, March 29, 2019--At Armstrong Flooring’s recent Design Council, held in Palm Springs, California, during Modernism Week, nine interior designers from across North America gathered to share their perspectives with Armstrong Flooring’s design team and commercial marketing group. Armstrong Flooring principal designer Razieh Council presented commercial design trends and the vision for what’s next in flooring. “The current trend in biophilic design will naturally advance, with designers exploring humans’ footprint on nature, as well as how weather and natural forces influence the materials we’ve manufactured,” she said. Each of the nine designers presented a collage of material that inspires their work and a palette of their favorite colors, along with their forecast of where design trends are heading. Fashion and textile designer Candice Held also participated in the Design Council event.